In lieu of flowers, memorial donations may be made to the El Dorado Christian School and left at the funeral home. 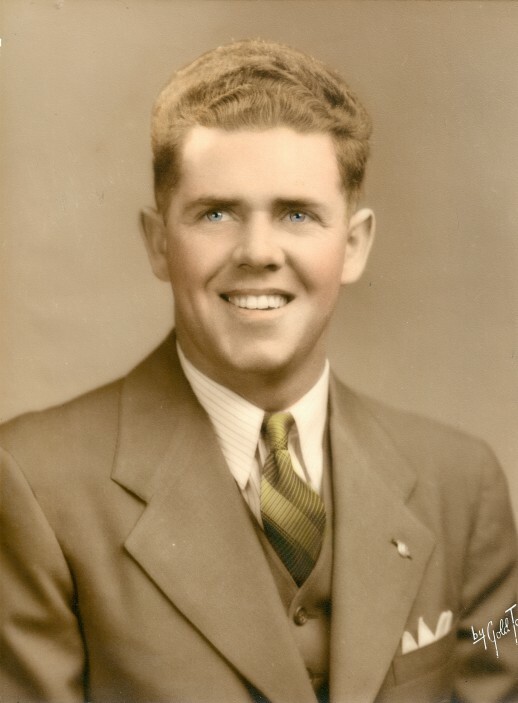 Clayton Howard Bland, age 94, of El Dorado Springs, Missouri, passed away at Cedar County Memorial Hospital on Sunday evening, November 2, 2014. Clayton was born on March 7, 1920, in a farm home near Birdsong, Missouri, to Joseph Israel Bland and Stella Josephine (Grimes) Bland, the seventh of eight children. Clayton lived and worked on the family farm in the Blackjack area until he was drafted into the Army. Clayton was saved on February 22, 1942, was baptized in the Sac River in December, 1945, and served the Lord faithfully for the rest of his life. Drafted into the Army on May 25, 1942, Clayton served as an instructor in the Army Automotive School, then was moved to the 656 Tank Battalion, and served in Germany until the war’s end there in May, 1945. Clayton was honorably discharged on November 21, 1945. In early 1946, Clayton moved to Kansas City, Missouri, where he worked at Ford Motor Company for 30 plus years. He lived there until moving to El Dorado Springs in 1999, where he lived until the end of his life. Clayton had a life-long love of baseball, playing often as a boy and young man, and introducing his sons to the sport. He was also an avid fan of the Kansas City Royals. Other hobbies that he enjoyed included hunting, trapping, fishing, keeping a beautiful lawn, playing the guitar, and enjoying his grandchildren. Clayton was an excellent mechanic, able to diagnose and fix almost anything. Clayton especially enjoyed these things when it involved time with family. The love of his life was Arleta (Ellerman) Bland, who became his wife on November 4, 1950. To this union, two sons were born, Ronald Clayton and Ralph Edwin. Clayton was an excellent husband and father. He worked hard to support his family, but saw to it that they played hard, too, taking fishing vacations to Minnesota for 17 years, quail hunting almost every Saturday of the season up into his early seventies, and fishing up into his eighties. Later in life, he enjoyed traveling and spending time in Branson with his wife. He was a consistent role-model, leading his family by example, taking them to church, and having regular family devotions. Clayton was much-loved by his extended family, as well, and had many friends. It has been said that he never knew a stranger. Clayton was a good example in just about everything. If you did what he did, you would not go wrong. In summing up his life, Clayton said, “I give God credit for all these good things that have come my way.” This was typical Clayton. He was content with and grateful for what God gave him, and faithful in all his responsibilities. Preceding Clayton in death were his wife, Arleta; his parents; his sisters, Hazel, Neva, Neta and Corda; and his brothers, Ewing and Nolan. Survivors include his sister, Winifred Hodo and husband, R.V. ; his sister-in-law, Nila Bland; his son, Ronald Bland and wife, Susan; his son, Ralph Bland and wife, Barbara; his grandchildren, Erica Bland, Rachel Bland, Clint Bland and Brooke Bland; and numerous cousins, nieces, nephews, great-nieces and nephews, and great-great nieces and nephews. Funeral services for Clayton Bland will be held at 10:00 a.m. on Thursday, November 6, 2014, at the El Dorado Springs Church of God (Holiness), with interment at Love Cemetery under the direction of Bland-Hackleman Funeral Home. Rev. Joe Trussell and Rev. Silas McGehee will officiate. Music will be provided by Wanda Casey, Faith Trussell and Strong Tower. The family will receive friends at the Bland-Hackleman Funeral Home chapel from 6:00 to 7:00 p.m. on Wednesday, November 5. Pallbearers are: Larry Bland, Randy Joe Bland, Travis Bland, Trent Bland, Dwain Witt, Don Witt, and Reggie Hamilton.